← Bible Contradictions #29: Did all the Egyptian cattle die during the fifth plague? Bible Contradictions #30: Can god do anything? The god that revealed himself to Abraham is literally the most complex thing imaginable, as his followers will tell you. He’s been constructed into a being that knows exactly everything you will ever do, yet still finds a way to give you free will so that you can do something that might surprise him. That’s some great power right there. Indeed, as the bible tells us, god can do anything and everything. Except the things he can’t do. First, as shown in the image above, god cannot lie. (But that’s a contradiction too. I covered it before). Second, he can’t do mighty work, which is a pretty lame handicap for an all-powerful deity. And third, we all know the story of the iron chariots; god couldn’t defeat them. That’s a lot of stuff that god can’t do, despite the fact that he can do anything. Of course, apologists will probably say that god can do anything; he just chooses not to. That’s pretty convenient of them. This entry was posted in Atheism, Bible Contradictions and tagged Atheism, Bible Contradictions, Christianity, Christians, contradictions in the bible, God, God of Abraham, Jesus, Religion, the bible. Bookmark the permalink. 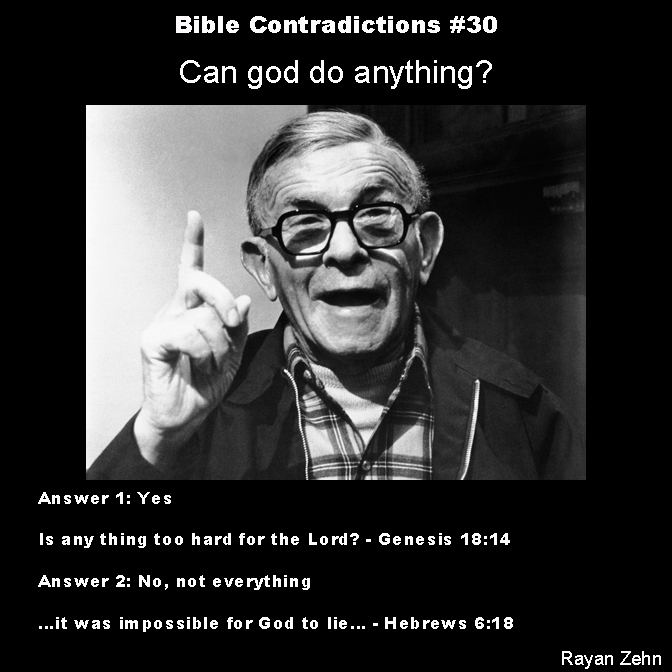 14 Responses to Bible Contradictions #30: Can god do anything? So the God of the Bible cannot lie and that makes him impotent and the Bible a fraud. Atheist desperation has taken you to the sewer of absurdity. It’s no wonder you’re so proud that the greatest mass murders in human history were carried out by atheists. But God is a fraud because he cannot lie. Sigh. Once again it appears that you didn’t even bother to read my post. There are words beneath the pictures, you know. Yes, as well as lacking any power in being omnipotent, omnipresent, omniscient, and omnibus. Since he obviously can’t even answer prayers. Lying is what human beings do. God is infinite, all-knowing, all-powerful, all-good. So the idea that God is not omnipotent because he can’t lie is an absurdity because you are applying a finite attribute to an infinite being. And you are incorrect, som. The biggest mass murderers in human history are Christians. I know, and it’s a shame you can’t spot the difference, silence. But, I suspect when one never tries to find any truth, and has themselves been lying for Jesus for all their lives, then one has merely convinced themselves of the Christian product, and no one else. So saith, the god of evil. Ha, ha! So much for being incapable of lying! There’s your finite being. 😉 lMAO! That would indeed also show you that god says you have no free will. When he can intervene with your thought process, then you have no free will at all, period. Yeah, mindless. Kind of like yourself, silence. Ha, ha! Knowing what someone is going to do has absolutely nothing to do with free will. For example, what does me knowing anything whatsoever about you, have anything to do with the choices you make? You choose what you want regardless of what anyone knows about you. This is even more so, if you don’t care about the person who knows about you. If you don’t care about God, what does his knowing about you have to do with the choices you make? It’s very apparent that you’re refusing to read that supposed statement from your evil god. So here it is again. Please learn to read and understand? If you do, I recommend that you take responsibility for it in stead of blaming God. I know I’m not the “them,” because “them” happened a long, long time ago. I take all responsibility for all my actions, so I’m not the one in pretense here. Unlike yourself, silence. If I have a trouble I’ll simply put the blame squarely on my own shoulders. Your the one suffering from delusion, silence.